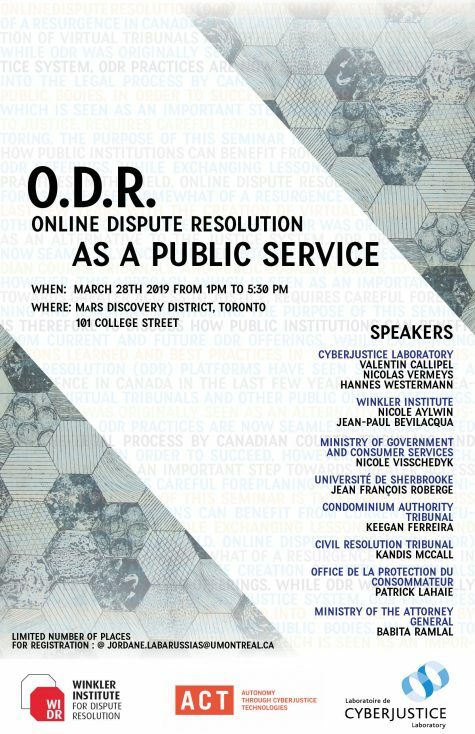 March 28th, 2019 will take place an open discussion regarding Online Dispute Resolution (ODR) as a public service, an initiative from the Cyberjustice Laboratory, the ACT Patnership and the Winkler Institute. Online dispute resolution (ODR) platforms have seen somewhat of a resurgence in Canada in the last few years with the creation of virtual tribunals and other public online offerings. While ODR was originally seen as an alternative to the justice system, ODR practices are now seamlessly incorporated into the legal process by Canadian courts, tribunals, and public bodies. In order to succeed, however, this approach, which is seen as an important step towards greater access to justice, requires careful foreplaning and constant monitoring. The purpose of this seminar is therefore to discuss how public institutions can benefit from current and future ODR offerings, while exchanging lessons learned and best practices in the field. This content has been updated on 04/18/2019 at 14 h 43 min.